AS 40% OF ALL HOUSE FIRES ARE STARTED BY KITCHEN FIRES, QUICKLY EXTINGUISHING SUCH FIRES IS ESSENTIAL. Suitable to use for the office, warehouse, ship, car, construct, house, kitchen, restaurant, amusement building, gas station etc. 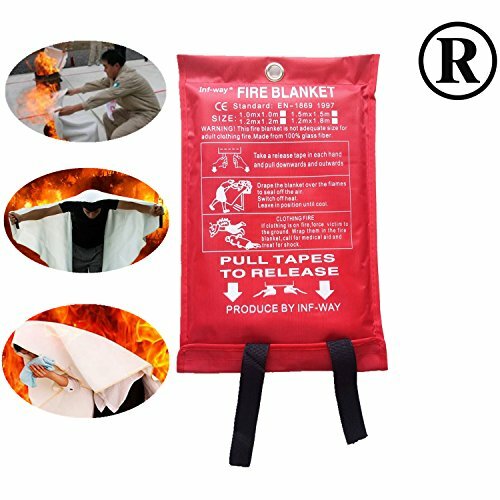 Inf-way is Registered Trademark for Fire Blanket, 100% high quality guaranteed! Material: Fiberglass cloth. 4 sizes for your choose. Protect your family. Stops stovetop fires fast and is easy to use, safe, clean, and non-toxic. Can also be used to wrap around your body and act as a heat shield. If you have any questions about this product by Inf-way, contact us by completing and submitting the form below. If you are looking for a specif part number, please include it with your message.